According to a Bloomberg survey, 26 of 27 market economist are expecting an interest rate hike somewhere in the next 12 months. Talk about herd-think. How has a rate hike suddenly become a consensus? Let me break it down. First up, who are these ‘economists’? These guys are the ‘analysts’ working at the investment banks and fund managers, but mostly they’re paid to be talking heads. They’re out there spruiking the odd bit of insight and analysis in order to boost the profile of their employer. And believe it or not, the rate hike story is actually a good news story. What they’re saying is that at some point in the next year, the RBA is going to think that economic activity is heating up so much, that they’re going to need to throw a rate hike into the mix just to cool things down. It’s a story of an economy starting to sizzle. And that story is good for their clients – big businesses, investors, each other. So these talking heads are out there talking the economy up – like air-conditioner salesmen talking up how hot this summer is going to be. Trouble is, talk is cheap. And it’s not just rouge outsiders like me who don’t believe them. Even their own traders don’t believe them. Because in the bond market – where banks can have a bit of a punt on where interest rates are going to be down the track – bond market futures show that the market is actually pricing in a rate cut in the next twelve months. So the traders – who actually have skin in the game – are doing exactly the opposite of what their economists are telling them they should do. But no one cares what the economists are telling the public – that’s just for clients. If you want to know what the banks actually think, listen the to money. Money talks. And right now, the money says that rates are going down. And personally, I agree with money on this one. Rate hikes are a possibility, but they’re not likely. And I think there’s every chance we’ll see rates drop a little lower yet. And the reason I think that is largely based on what’s happening on the international stage. Conditions are probably strong enough in Australia to justify backing off the throttle a little, but the international situation is keeping downward pressure on rates. Inflation in Australia is currently comfortably soft. It’s moving towards the bottom of the RBA’s target band (2-3%), but it’s still in the target band. The RBA’s still on target. These days, that’s an enviable situation to be in. Take a look at this chart here. 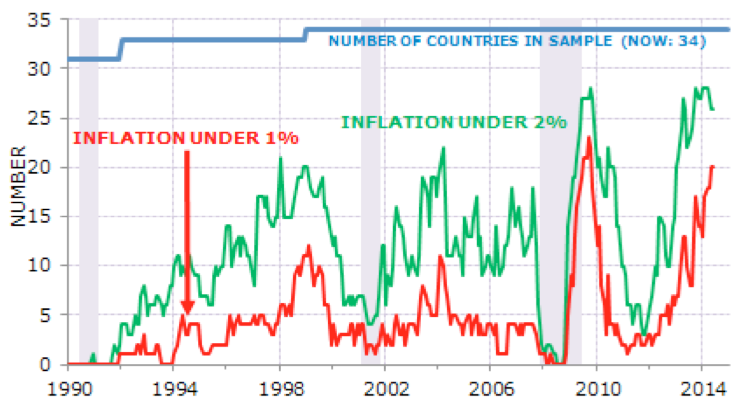 This counts the number of OECD countries with inflation below 2%, and the number below 1%. Right now, 20 out of 34 OECD countries have inflation of less than 1%. The spectre of inflation has been vanquished from the globe, but now we’ve got his even scarier brother to deal with – the ogre of deflation. It’s a deflationary world and that puts downward pressure on Aussie interest rates in two ways. First, if prices of foreign goods are falling, then we’re less likely to ‘import’ inflation through higher prices of foreign stuff. Secondly, this situation is reaching fever-pitch right now, and Europe in particular is going hard on the policy levers to avoid a catastrophe. That means super low interest rates. And remember official interest rates are still effectively zero in Japan and the US. So while our official 2.5% might be a record low, by international standards, it’s actually pretty high. That means that Aussie assets are paying more than other assets. That makes them more popular. But to buy them, you need Aussie dollars. That means extra demand for Aussie dollars and that pushes the price up. The Aussie dollar becomes expensive. 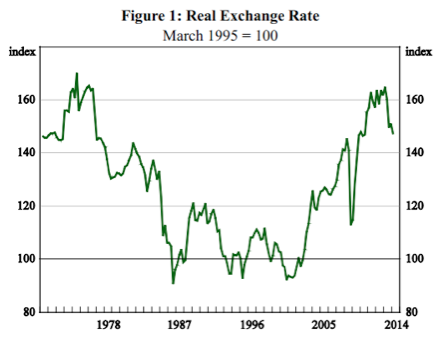 The RBA has made no secret of the fact that it would like to see a lower dollar. Everyone would. It could do to be a lot lower. But it seems that that’s only going to happen when Aussie interest rates fall into line with the rest of the world. Now I can’t see the situation in Europe turning around anytime soon, so that means, at least over the next 12 months, there’s going to be a strong incentive to bring Australian interest rates even lower. Will they do it? Maybe they will, maybe they won’t. But I definitely don’t see rates going higher. Someone should have surveyed me. Interest rates going up or down in the next 12 months? Does that mean you will stop or accelerate your investing?